Florida International University (FIU) is pursuing a business partner interested in commercializing a method of separating male sperm cells and female epithelial cells in a sample. Traditionally, cotton swabs have been used for collection of biological samples such as body fluids, touch samples, or other trace evidences. Despite being a common tool for sample collection, sample extraction from these swabs can be challenging due to strong adherence of the sample to the matrix. Often the bulk of a collected biological sample remains entrapped in the cotton fibers even after elution, resulting in a loss of precious evidence. For sexual assault casework in which there is a mixture of body fluids present, there are two challenges. First, the evidence is often overwhelmed with the victim’s vaginal epithelial cells and secondly the poor recovery from the swab can often make it difficult to recover the suspect male DNA profile. Current separation extraction methods are difficult and time consuming, involve multiple wash steps, and produce insufficient sperm DNA recovery. Although there have been a number of efforts to improve either the recovery or the extraction of DNA from swabs taken following a sexual assault, the ability to achieve both would be desirable, especially for situations in which sample is limited. 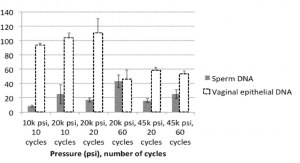 FIU inventors have developed a two-step protocol using pressure cycling technology (PCT) and alkaline lysis for differential extraction of mixture of sperm and female epithelial cells. Pressure treatment of the mixture in the presence of alkaline conditions results in a near complete recovery of female epithelial DNA. 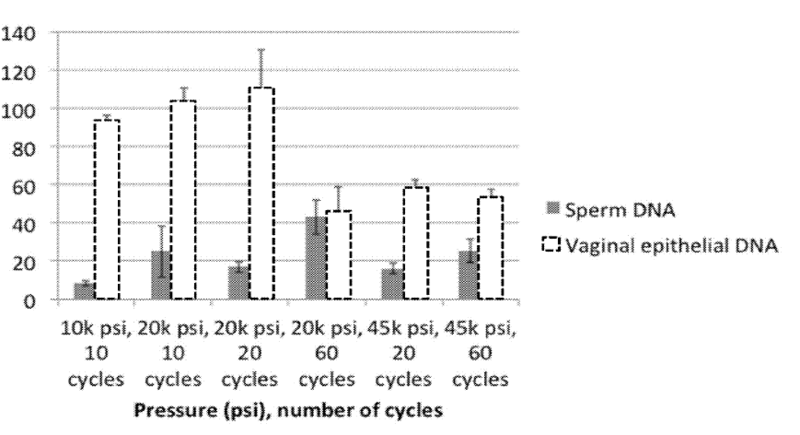 Following this pressure treatment, exposing the composition to alkaline conditions at higher temperatures results in selective recovery of sperm DNA with minimal contamination from female epithelial cells.